The City of Oudtshoorn in South Africa. 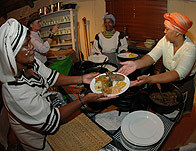 Enjoy the delicious food, traditional dances and magnificent stories of the rich Xhosa culture! 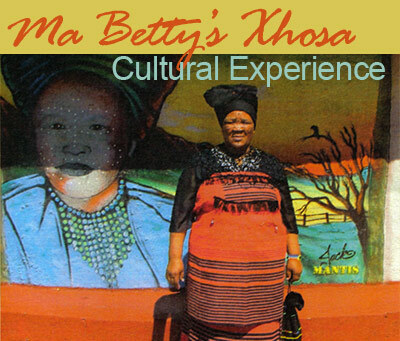 Ma Betty Jantjies is a prominent resident of Oudtshoorn's Bongolethu Township and a Xhosa purist. She runs her Authentic Xhosa Village with pride and diligence. Together with a women's group she prepares food according to old Xhosa traditions. The dishes are prepared on open wood fires in black iron pots and therefore have a unique flavour. To experience the great taste of Xhosa cuisine we suggest you have the traditional Xhosa meal. Entertainment is also offered in the form of energetic dancing and stories told by a traditional healer (Sangoma) with Xhosa singing. The women are eager to talk to the visitors about the preservation of their culture. Help preserve this culture by having the delicious meal and enjoying the traditional activities. 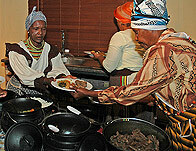 All the food is made according to the traditional Xhosa recipes which have been passed from generation to generation. 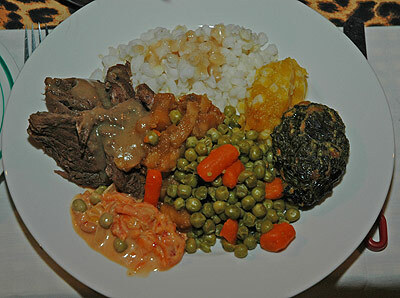 Succulent lamb, samp, pumpkin/sweet potatoes, mixed veggies/spinach, steam bread with cheese and jam, fruit and cool drinks. Traditional chicken and ostrich kebab with delicious roasted bread. Xhosa beef sausage with tomato stew and thick corn porridge. Lamb or beef with tomato stew and thick corn porridge. Freshly made Xhosa steam bread with butter, cheese and jam. Roasted bread with butter, cheese and jam. Besides the wonderful food Ma Betty also offers fun-filled traditional activities to make your evening complete. Traditional Xhosa dance and music performed by the Xhosa women. Traditional Xhosa stories told by the Sangoma (traditional healer) accompanied by Xhosa songs. Transport from tourist office to Cultural Village charged per person return. Alternatively you use your own transport. Bongolethu, meaning “our pride”, is one of the numerous impoverished townships in South Africa that has been excluded from any significant socio-economic development. Bongolethu township is in the Oudtshoorn district, Western Cape and has been identified by the Department of Social Services as one of the poorest communities in the Klein Karoo. Tourism is the biggest job creator and income generating activity in Oudtshoorn. Approximately 350 000 tourists visit Oudtshoorn annually but the community of Bongolethu has had little benefit from tourism. During the apartheid era, thousands of black people were removed a few kilometres outside Oudtshoorn and currently 93% of these men, women and youth are unemployed. A lot of people make a living from informal trading. 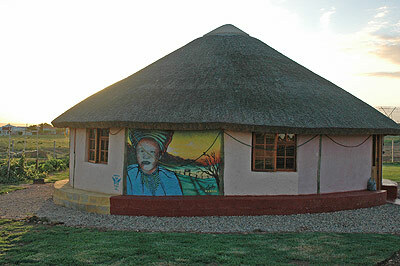 Ma Betty's Xhosa Cultural Village is one of the projects chosen by the Oudtshoorn Tourism Bureau to develop tourism in Bongolethu. 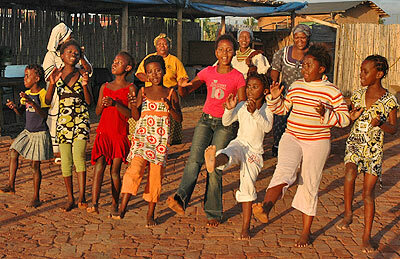 By enjoying this wonderful town experience you are also contributing to the upliftment of this impoverished community. The Xhosa people have been living in South Africa for over 1500 years and some still keep their traditions intact. The main population of Xhosa people is centralized in the Eastern and Western Cape provinces. Most of the Xhosa people were relocated by the apartheid government to townships like Bongolethu. Nelson Mandela is one of the most famous Xhosa people. 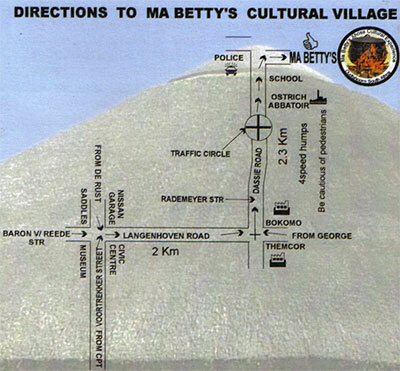 To enjoy a Ma Betty’s cultural experience we ask you to make a reservation (at least one day before intended visit ).